DO-IT's 25th Anniversary: Celebrate With Us On July 25th! On July 25th, at 7:00 pm, DO-IT will be hosting a 25th anniversary celebration on the University of Washington Seattle campus. The event will feature speakers from the DO-IT community, DO-IT’s annual Trailblazer Awards ceremony, a keynote message from DO-IT’s founder and director, and a celebratory dessert. If you would like to attend, please RSVP by July 21st. DO-IT has many programs directly serving students and job seekers with disabilities. In addition, DO-IT’s education and training efforts are helping teachers, parents, college faculty, service providers, employers, and others work more effectively with them. 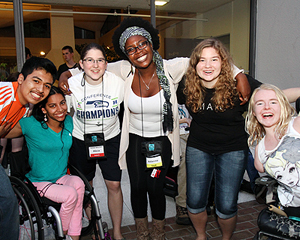 DO-IT solicits support each year to supplement funding for the DO-IT Scholars program, which hosts a multi-year two-week summer study on the University of Washington campus for high school students with disabilities. For more information about participating in DO-IT activities or making a financial contribution, visit our 25th Anniversary webpage. Media inquiries should contact DO-IT Program Manager Scott Bellman, 206-685-6222, swb3@uw.edu.